On their own, educators don’t have all the tools or dollars necessary to create and maintain the entire education-to-careers pipeline. They must build effective partnerships throughout their communities to be effective in recruiting, teaching, and placing students into rewarding careers. So what’s the first step? The education community must set its priorities and determine what partnering could do to enhance the success of its students, thus providing a strong return on the investment of time and energy expended in forming or strengthening a career pathways partnership. It must take a holistic view of the community’s economic and workforce development needs as a means of improving the lives of each and every person in the community. Partnership building thrives on a sense of urgency that can motivate a broad spectrum of people in the community to grapple with problems and issues and coalesce around solutions. 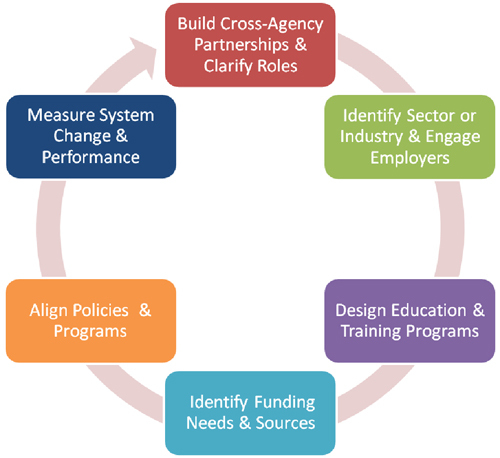 Building partnerships across agencies and institutions is the first step in creating a career pathways system. Below is a diagram of the U.S. Department of Labor Employment and Training Administration’s “Six Key Elements of Career Pathways.” Local teams working collaboratively to develop a career pathways system should facilitate and coordinate these elements to ensure the system is comprehensive. To build your career pathways partnership or expand existing partner relationships to support career pathways, begin with an inventory of areas in which a partnership could help design, develop, pilot and scale a career pathways program as well as an inventory of the existing institutions/agencies in the community with whom partnerships could be developed. The inventory and list of groups should be matched and then ranked according to potential for partnering. Your most likely partners are represented among the groups listed below. Each partner organization brings different perspectives and resources to the table: education and training, support services, jobs. Among your priorities is ensuring that all partners are willing to take a broad view of the community’s needs for the benefit of all its citizens. Educational attainment, economic growth, and quality of life go hand in hand. When you ask your potential partners to envision their ideal community, you might be surprised at how similar the picture each of them draws, regardless of the organizational or institutional perspective they represent. When you share the benefits that a career pathways system has to offer, the conversation can quickly move to how each partner can contribute to that system. For example, the process of building a Career Pathway in healthcare would initially involve convening CEOs from local healthcare and healthcare-related employers to determine the current and future need for nurses, respiratory therapists, physicians’ assistants, phlebotomists, and related positions. Based on feedback from local employers, the education community would consider its current Programs of Study and the mechanisms needed to modify existing and/or develop additional programs. The potential roles of the workforce system and community agencies would quickly come into play as you consider what it will take not only to design and launch the program from a content development standpoint, but the recruitment of potential students and the support services they will need to stay engaged and on track toward completion. In establishing a plan of action for forming the career pathways partnership, consider the structures and meeting agendas needed to convene the required personnel and agree upon goals, objectives, timelines, and agendas. The plan may call for the establishment of a steering committee, a board, and advisory committees. Further, the plan should include strategies for seeking and adding regional involvement. Overall, the intent is to create a partnership that serves as an advocate for Career Pathways programs and services, to embed the programs within the community, and to leverage the resources of the partnership to enhance curriculum and students’ ability to complete it. At the very least, establishing new and/or strengthening existing business-education advisory committees can be a very important first step. Leverage resources (equipment, facilities, materials, and other community partnerships). Cluster or pathway-specific advisory groups provide the best and most concentrated focus and assistance. Where possible, advisory committees should include representatives from both secondary and postsecondary components of the career pathway program to provide the most effective, efficient, and seamless articulation. The establishment and nurturing of effective advisory committees will take some time. Considerable planning should take place ahead of selecting advisory committee members, and consideration must be given as to who should chair the committee, how it will be maintained and evaluated, and how it will be structured to best serve the region’s education and business community. Explore the National Career Pathways Network’s Advisory Committee Toolkit in the Resources section of this module for further guidance and forms you can use with your committee(s). To be effective and sustainable, career pathways partnerships should be formalized in writing. Formal agreements provide for a working framework for each partner, setting expectations and desired outcomes. When approved and signed by each partner, the formal agreement elevates the partnership and its work. Each agreement should state the purpose of the partnership and describe its benefits to the partnering entities. It should include the broad strategic direction of the partnership and the outcomes expected. The agreement should form the basis of active management of the partnership and provide meaningful action plans and guidelines for meetings and communication. It must be built with an eye toward building trust and mutual respect as a foundation for future endeavors. Create written memoranda of understanding that specify the roles and responsibilities of the partnership’s members. Conduct ongoing analysis of economic and workforce trends to identify which regional Programs of Study should be created, expanded, or discontinued. Connect to existing initiatives that promote workforce and economic development, such as sector strategies and other activities supported by the Workforce Innovation and Opportunity Act as administered by the U.S. Department of Labor. Identify, validate, and keep current the technical and workforce readiness skills that should be taught within each Program of Study. Keep in mind that every partnership should be of equal advantage to all participants. Too often education seeks a one-sided relationship and does not consider the strategic, long-term advantages to each partner, nor does education typically recognize the value of the return on investment (ROI) for all concerned. His position moves the conversation closer to an ideal situation in which pathways-specific advisory committees take ownership of the curriculum and of its ultimate outcomes. In the next module, we’ll take a more in-depth look at engaging employers and building sustainable relationships around career pathways.